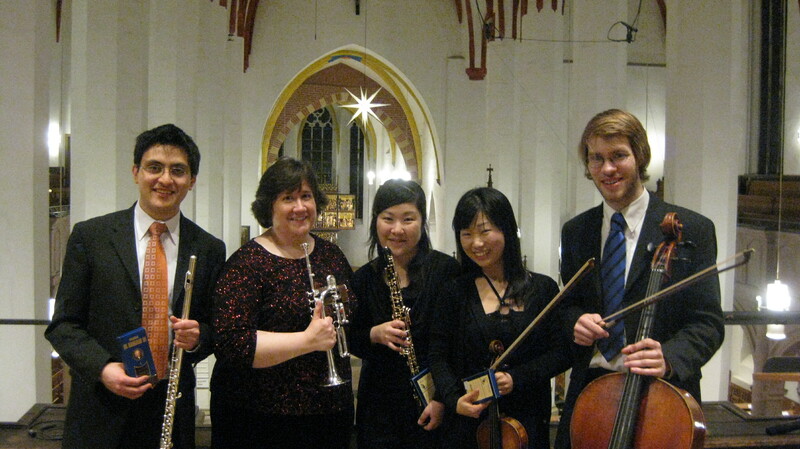 The soloists for the Brandenburg (from left): Dante Montoya (flute), Elisa Koehler (trumpet), Ayumi Mita (oboe), Kyung Won Lee (violin), and our terrific continuo cellist, Martin Knörzer. Thanks to the ever-amazing Kurt Oberschäfer, I now have a PDF copy of the review of last Saturday’s concert from the Leipziger Volkszeitung (see link below). I also want to take this opportunity to thank the wonderful students from the Detmold Hochschule für Musik for their artistry, professionalism, and great working attitude. It was a pleasure and a privilege to make music with them! On a related note, I am currently in the process of securing professional English translations of all of the reviews and articles and hope to post them here in the future. Stay tuned!